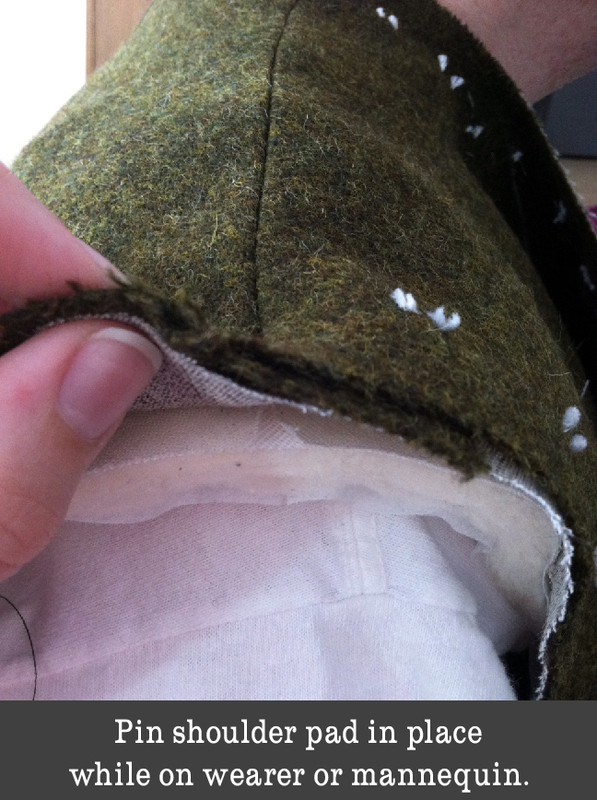 Today is a bit of a shorter post during which Dana demonstrates how to securely place the shoulder pads and shows us her method for assembling the side and shoulder seams of the coat and lining. You may notice that the procedure is a little different than outlined in the Goldstream Peacoat instruction booklet because the lining pieces have already been separately basted to their corresponding self pieces. 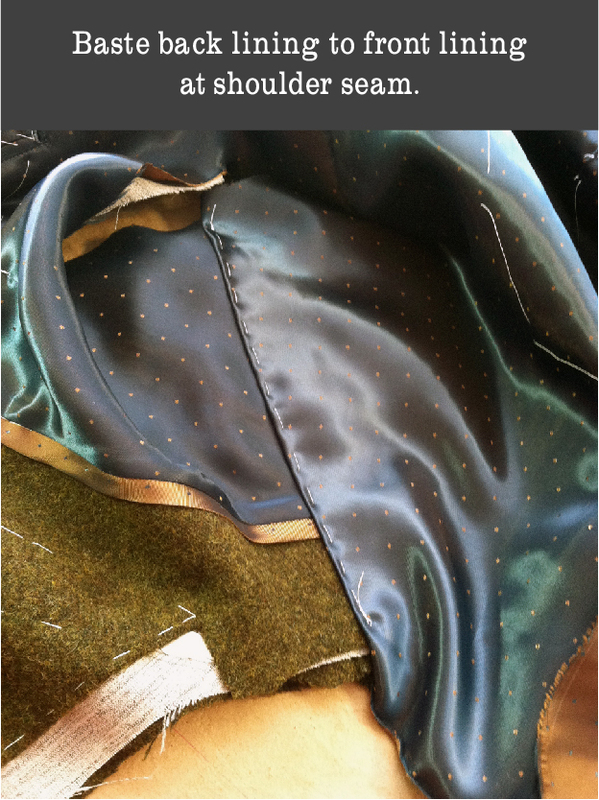 Dana’s process involves a lot of hand stitching to complete the lining and I am sure you will agree that this is a very effective way to ensure complete accuracy when sewing such a slippery fabric. 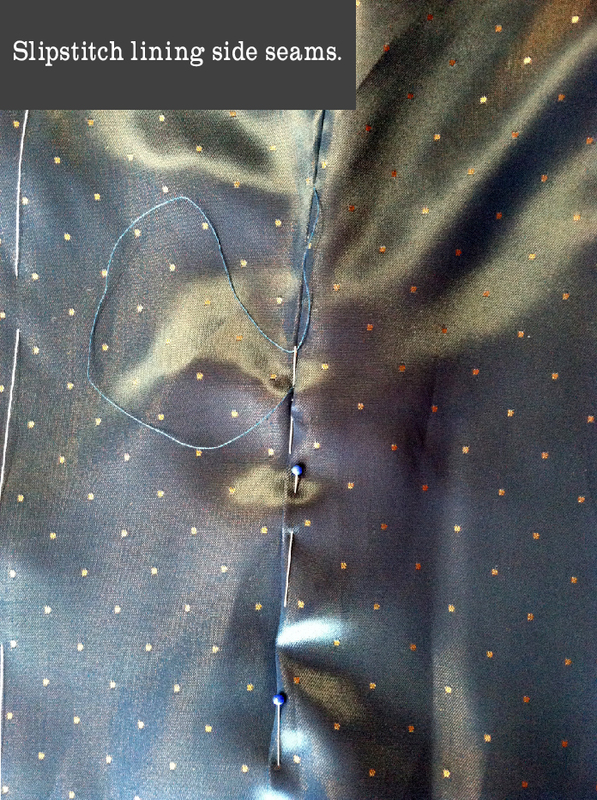 Sew the side seams together and press open. 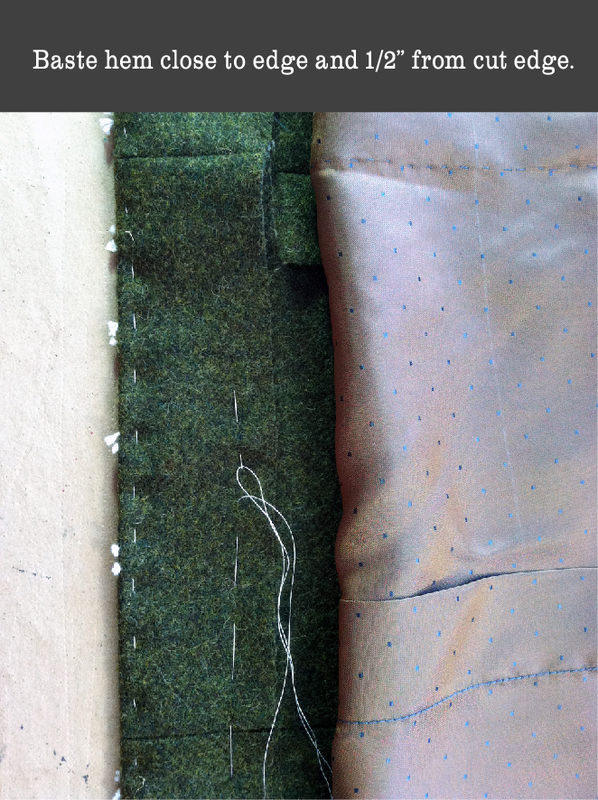 To sew the lining, at the side seams, fold one edge over the other making sure there’s a bit of ease in the lining. Slip stitch the lining seams. Baste the hem up close to the edge, then again about half an inch down from the cut edge. 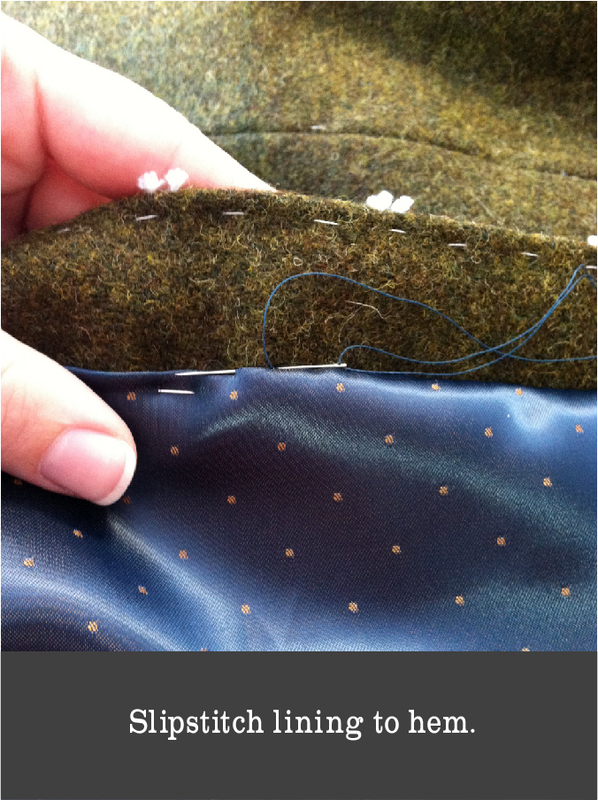 Make an ease pleat in the lining, then slipstitch the lining down. Sew the shoulder seams. Since most back shoulders are bigger than the front shoulder, its easiest to sew with the front on top and the back will ease itself in while you stitch. I’ve found it much easier to place shoulder pads when the coat is on a dress form, or at least on a person. 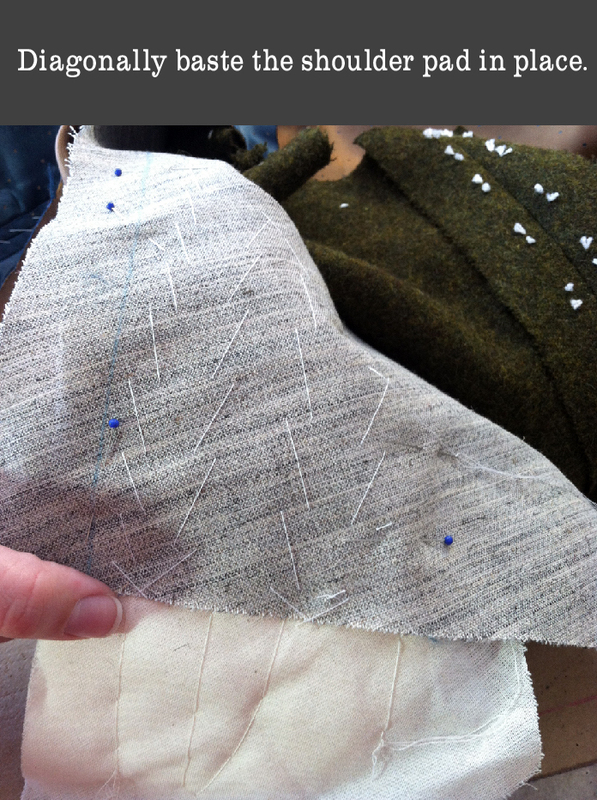 My shoulder pads have a center notch; align this with the shoulder seam, and pin the pad in place. Move the pins so they’re holding the pad to the canvas (separated from the coat fabric), and diagonally baste the pad from the canvas side. Turn the canvas over, and cross stitch the pad to the canvas. 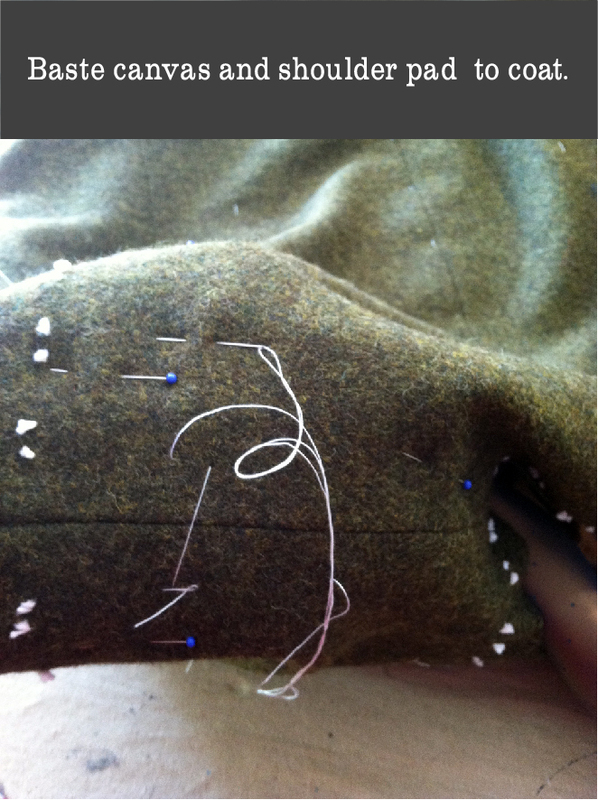 Re-align the canvas and shoulder pad in the coat (its easy to do this over your hand) and baste it in place. Fold the back lining over the front lining and facing, and baste in place. That’s it for today! The main body and lining of your coat is now assembled. Tomorrow we will be working on the collar. Look forward to trying out some pad stitching (I’m excited for this part because I have never tried doing this before!). i am loving these posts! 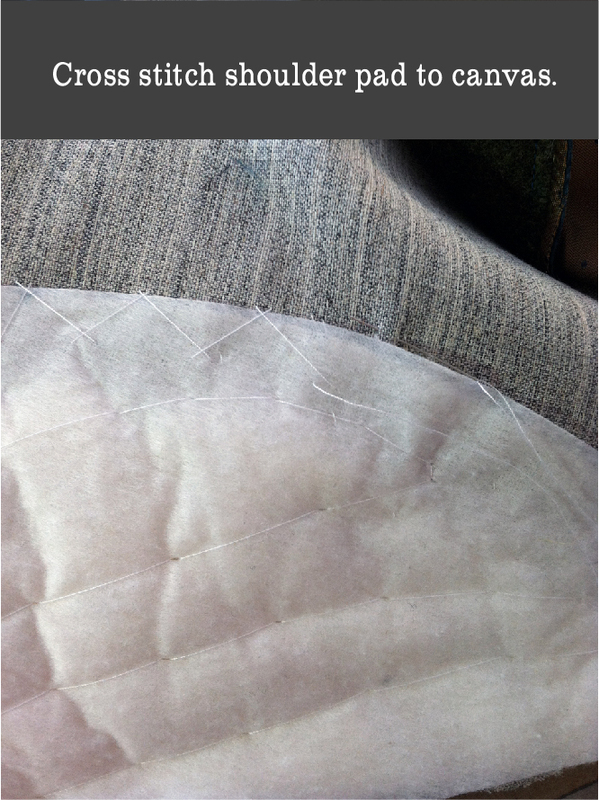 i’m one of those people who avoid basting and handstitching whenever possible… but this has me rethinking my ways! i will most defnitely have this marked for future reference. I know, I am the same! I certainly have a tailored peacoat planned for Matt in the future!